Composed by Don Besig. Choral. Sacred Anthem, General, Lent. Octavo. Lorenz Publishing Company #10/4705L. Published by Lorenz Publishing Company (LO.10-4705L). 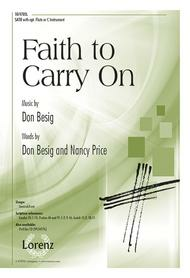 Don Besig and Nancy Price weave the Swedish "Children of the Heavenly Father" melody with a remarkably fresh text. 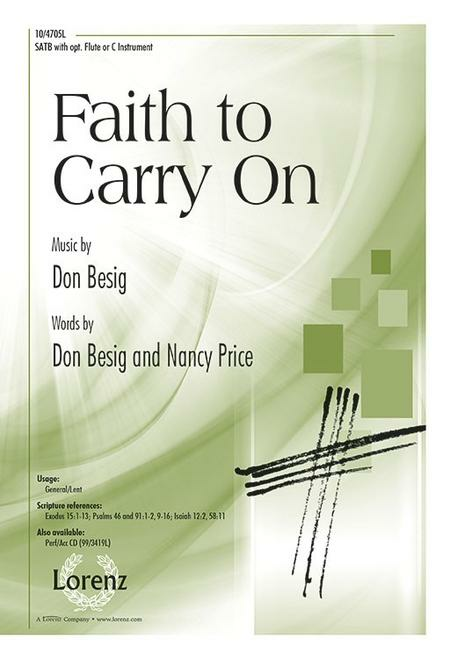 This inspiring selection, which includes a flute countermelody that soars above the flowing piano accompaniment, serves as a powerful reminder that God's guidance and strength give us the faith to carry on. What a wonderful way to end a concert! Our community choir sang this in 2018 with cello accompaniment. Very easy to learn with beautiful harmonies. Beautiful composition! Very popular with my Choir and was well-received by the congregation. Message of hope and faith for tough times when we may question God's purposes and timing. Easy accompaniment and very do-able with small Choir. is just wonderful as it builds up to a majestic crescendo towards the end. The transition in the scale adds to the build-up. The accompaniment is simple yet melodious. The shift in melody between different voices brings out the inherent meaning contained in the words of the song. I feel like listening to it again and again. Thank you Don and Nancy. God bless.